Soak up the vibrant atmosphere of Philadelphia’s University City, home to the University of Pennsylvania (Penn) and Drexel University. Experience dynamic campus life as you follow your local guide to the universities’ prettiest and most historical buildings. Admire Victorian architecture in surrounding neighborhoods, explore a city park, pass a cemetery and enjoy tasty bites from street food vendors. End your tour with a trolley ride! After meeting at 30th Street Station in the morning, you'll leave on foot down Market Street; stopping for a taste of the Caribbean at the first group of food truck stops. Down the road is Drexel University, a private research institution founded in 1891. Walk down one of the green quads and into the Main Building, the campus’ oldest building. Marvel at the classical Renaissance architecture and its splendid interior, the multi-story arcaded walls of the Grand Court, all virtually unchanged since the university's founding. Walk down the hill past World Cafe Live, a live music venue, and enter Penn Park, a new green space with spectacular views of the Philadelphia skyline. Pass some of the most iconic college sports venues in the country, such as Franklin Field and the Palestra, and then enter the heart of the University of Pennsylvania (Penn) campus, which opened its doors in 1751 and credits Benjamin Franklin as its founder. 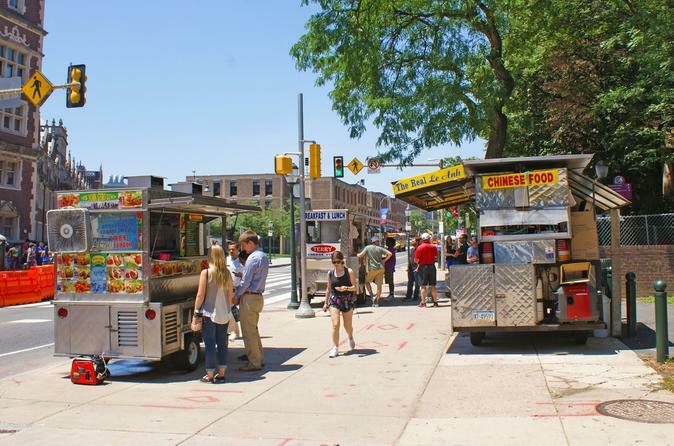 At Franklin Field you will reach the second group of food trucks during the heart of lunch hour as you make your way to Penn's campus. Your guide will lead you past Fisher Library, an architectural masterpiece created by Frank Furness, and past College Hall, with its characteristic green hue. Enter Houston Hall, home of the country’s first Student Union, and then continue up Locust Walk, a picturesque campus promenade. From there you will end up on Spruce Street with the third group of food trucks lining the streets and you'll be treated to something sweet at the final location. Lastly you'll walk through hidden preserves and a pond on the campus making your way to the trolley stop where your guide will provide a token for each person, valid for a ride on the trolley. From this point, you'll have the choice to ride back to 30th Street or continue to Center City.